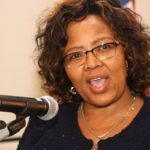 THE state this afternoon concluded its corruption case against Katrina Hanse-Himarwa in the Windhoek High Court, with the education minister expected to testify in her defence when the matter resumes tomorrow morning. The last witness for the state, the chief investigating officer of the Anti-corruption Commission (ACC), Phelem Masule, was on Monday called to the witness stand to testify. After giving his evidence in chief, Masule was taken under cross examination by Sisa Namandje, Hanse Hamirwa’s legal representative, during which he denied that the ACC made a concerted effort to incriminate the minister. While in the witness box, Masule stated that he was deployed as the chief investigator and that he consolidated all the statements taken from the Mariental Town Council Chief Executive Officer, Paul Nghiwilepo. He claims that Nghiwilepo did not object to his four statements being consolidate and put together into one file. While under cross examination, Namandje argued that the four statements that were not given to the Prosecutor General and the ACC Director were equally relevant to the case. “It was his own statement. I had no influence with it, whatsoever. The consolidation of statements was my idea though, for convenience sake,” Masule said, when questioned by the defence why he didn’t bring all the statements by the CEO. Masule further indicated to the court that Nghiwilepo still refuses to tell him the name of the person who had informed him that the people added to the mass housing list were related to Hanse-Himarwa, who was the Hardap governor at the time. “He insisted that he learned about it through the “grapevine”. It is unethical to force a witnesses to give me information. My job was simply to get their statements,” Masule said.